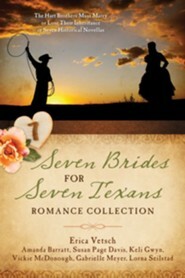 Texas in 1874 will be filled with changes for the seven independent Hart brothers. When their father becomes ill he threatens they each will lose their portion of inheritance in the family ranch, if they can't find a bride with in one year. They must trust that God will lead them to find true love even if they are on a deadline. Seven brothers must marry within 1874 or lose their inheritance. Meet the seven Hart brothers of the 7-Heart ranch in central Texas. Each man is content in his independent life, without the responsibilities of a wife and childrenuntil their father decides 1874 will be the year his grown sons finally marry, or they will be cut from his will. How will each man who values his freedom respond to the ultimatum? Can love develop on a timeline, or will it be sacrificed for the sake of an inheritance? As the youngest Hart, Hays has never been first at anythingso hes determined to be the first to marry. He sets his sights on the new teacher, Miss Emma Longley, but he soon discovers Emma wants nothing to do with marriage, ranching, or Texas and plans to leave Hartville in two short months. Will Hays charm be enough to convince her to stay? With Texas awash in outlaws, Ranger Chisholm Hart takes his oath to protect the citizens and their property seriously. When he meets feisty, independent Caro Cardova who can face a band of vigilantes, ride as well as a man, and shoot from the hip, he must decide if he can make room in his heart for both the state he loves and the woman whos stolen his heart. Despite his fathers edict, Travis Hart is determined never to marry. The one woman he cares for is a distant memory, and he wont settle for a loveless union with anyone else. Yet when Annie Lawrence re-enters his life, the spark of romance he thought extinguished, bursts into flame anew. But guilt binds Annie to her past, and Travis fears that once again, he will have to watch the woman he loves walk out of his lifethis time forever. When Coralee Culpepper declined his proposal, Houston Hart left Texas for the gold fields of California. But when his fathers edict brings him home, will Coraleethe only woman to ever claim his heartaccept him for the man he is, or will she cling to the stubborn notion that she must marry a rancher in order to be happy? Burned out of their house, Jane and her family move into a cave, where she discovers some hidden money. Crockett Hart comes to help them rebuild, and she asks for his help. When he learns where the money came from, he hopes it wont keep their two families apart, because hes falling for Jane. Austins best hope to marry quickly is a mail-order bride. But the bride who arrived seems more interested in one of the ranch hands. Her sister Rebekah, who is chaperoning, keeps apologizing. Austin is ready to send his bride packing. Could God have other ideas for a wife for him? When her former patient, Confederate officer Bowie Hart, shows up on her doorstep, Elise Rivers agrees to his marriage-of-convenience proposal. But as she gets to know her scarred and taciturn new husband, she realizes she has a chance to turn a marriage-of-convenience into the love of a lifetime, if only she can convince Bowie that he is worthy to be loved. Susan Page Davis is the author of more than seventy Christian novels and novellas, which have sold more than 1.5 million copies. Her historical novels have won numerous awards, including the Carol Award, the Will Rogers Medallion for Western Fiction, and the Inspirational Readers Choice Contest. She has also been a finalist in the More than Magic Contest and Willa Literary Awards. She lives in western Kentucky with her husband. Shes the mother of six and grandmother of ten. Visit her website at: www.susanpagedavis.com. Award-winning novelist Keli Gwyn is a California native who lives in a Gold Rush-era town at the foot of the majestic Sierra Nevada Mountains. Her stories transport readers to the 1800s, where she brings historic towns to life, peoples them with colorful characters, and adds a hint of humor. She fuels her creativity with Taco Bell® and sweet tea. When she’s not writing, she enjoys spending time with her husband and two skittish kitties. Gabrielle Meyer lives in central Minnesota on the banks of the Mississippi River with her husband and four young children. As an employee of the Minnesota Historical Society, she fell in love with the rich history of her state and enjoys writing fictional stories inspired by real people and events. Gabrielle can be found at www.gabriellemeyer.com where she writes about her passion for history, Minnesota, and her faith. Lorna Seilstad brings history back to life using a generous dash of humor. She is a Carol Award finalist and the author of the Lake Manawa Summers series and the Gregory Sisters series. When she isnt eating chocolate, shes teaches womens Bible classes and is a 4-H leader in her home state of Iowa. She and her husband have three children. Learn more about Lorna at www.lornaseilstad.com. And you can email her at ericavetsch@gmail.com or contact her on her author Facebook page. 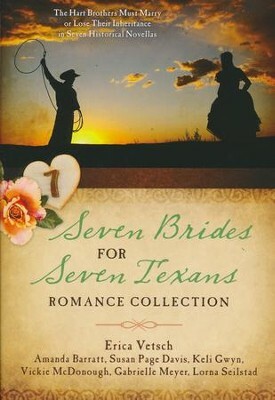 I'm the author/artist and I want to review Seven Brides for Seven Texans Romance Collection: The Hart Brothers Must Marry or Lose Their Inheritance in 7 Historical Novellas.